I have decided to do product empties posts just because I can give quick views on the products that I have used and if they helped me or did nothing for me. I could also easily include how much they cost (if I can include that detail) and where to purchase these products. These posts are not exclusive to makeup products but products that have either helped me with my makeup or just some facial skincare items. Although FiercePaint is dedicated to makeup, facial skin health is important for flawless makeup application. With that being said, here it is, my first ever ‘product empties’. 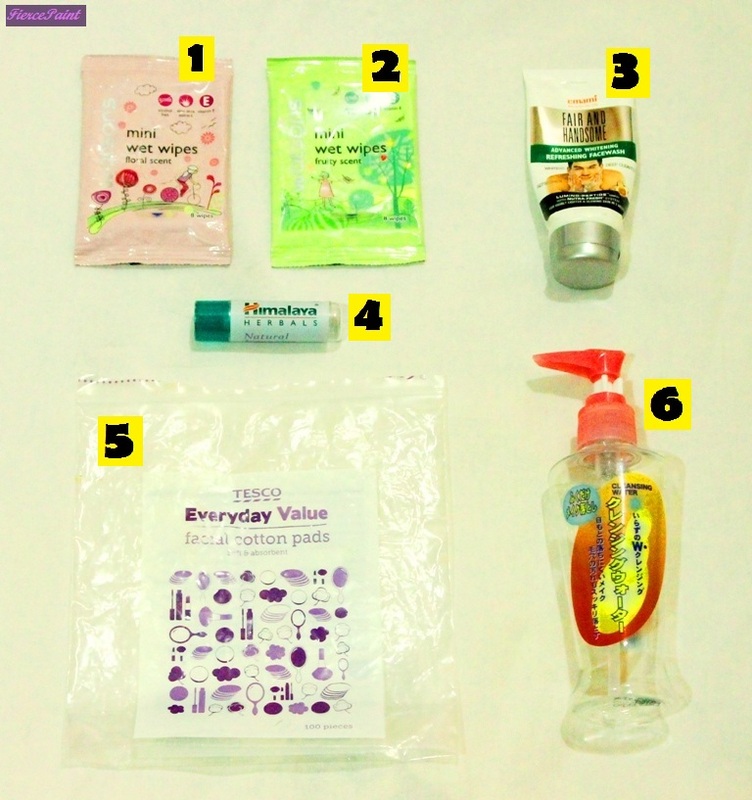 1&2; are Watsons brand wet wipes which I bought so that I can get discounts! HAHA!! However, they’re handy little things that you can use to just gently cleanse your face or even wipe your hands with. They’re just basic wet wipes with nice scent(s) and they cost MYR 1.20. Would I repurchase these? Probably not, unless of course, I would get in-store discounts! 3; This is a facial cleanser for men from the brand Fair and Handsome by the company Emami. It is an Indian based company and I picked this up at an Indian Cash and Carry store. I didn’t feel a marked difference with my skin as with the claims of this product that it makes the skin brighter in addition to giving a deep cleanse. Besides, I have never used cleansers in the past with the goal of brightening my facial skin. Probably using a few more tubes may give results but there is one ingredient present in this product that I don’t like which is menthol (it is unfortunately present in many facial cleansers for men). Price; MYR 8.90. I don’t think I’d repurchase this. 4; This is the Himalaya Natural Intensive Lip Balm which is really one of my favorite lip balm but I chose not to do a review on this because it isn’t so easy to find. In fact, very few Indian Cash and Carry stores even carry this product. I would repurchase this and I am hoping it is still available. I don’t remember the price but I am pretty sure it was under MYR 10. 5; Tesco Everyday Value facial cotton pads are cheap and they get the job done. I use them to apply my toner and take off my makeup swatches. They cost about MYR 1.50 for 100 pieces! They even come in packs of two at MYR 2.55. I already have two extra packs in addition to one that I am halfway done with. Repurchase? It’s on my next Tesco shopping list!!! 6; This is an empty bottle of Daiso facial cleanser, however, I have actually have a different use for the cleanser itself. You can read about it here. Repurchase? YES! I already have a backup bottle in addition to one currently in use. I bought them pre-GST (MYR 5) but they now cost MYR 5.30 (including all Daiso items).